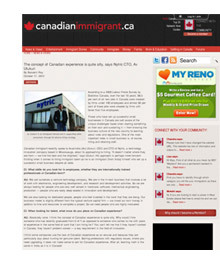 Diversity in Small Business – Canadian Immigrant magazine – Nytric Ltd. According to a 2009 Labour Force Survey by Statistics Canada, over the last 10 years, 98.5 per cent of all new jobs in Canada were created by firms under 100 employees and almost 60 per cent of those jobs were created by firms with fewer than five employees. Those who have set up successful small businesses in Canada are well aware of the unique challenges faced when starting something on their own and sustaining it – from knowing the business culture of the new country to learning about rules and regulations. One of the most important roles in small business is, of course, hiring and retaining staff. Canadian Immigrant recently spoke to Avanindra (Av) Utukuri, CEO and CTO of Nytric, a technology innovation company based in Mississauga, about its approaching to hiring. It doesn’t matter where they are from – we hire the best and the brightest,says Utukuri. His approach is perhaps more forward-thinking when it comes to hiring immigrant talent as he is an immigrant (from India) himself who set up a successful small business despite all odds. CI: What skills do you look for in employees, whether they are internationally trained professionals or Canadian-born? AU: We call ourselves a venture technology company. We are in the hi-tech business that involves a lot of work with electronics, engineering development, and research and development activities. So we are always looking for people who are very well versed in hardware, software, mechanical engineering, production and people who are really deep seated in innovation and development. We are also looking for dedicated people, people who feel invested in the work that they are doing. Our business model is slightly different from the typical venture capital firm – we invest our own money in addition to time and resources to complete a project. So we need people who are highly motivated. CI:Â When looking for talent, what onus do you place on Canadian experience? AU: Absolutely none. I think the concept of Canadian experience is quite silly. Why would I hire someone who has recently graduated from U of T as opposed to someone who comes to me with years of experience in the same field of work that I am hiring for? You can’t tell me that if they haven’t worked in Canada, they haven’t problem solved – a key requirement in the field of innovation. I think some companies use the lack of Canadian experience as an excuse and because they are particularly lazy about hunting for genuine talent. Barring professions with regulatory issues, where you need upgrading, it does not make sense to ask for Canadian experience. After all, learning math is the same in India as it is in Canada! CI: Language and communication skills appear to be the primary concerns when hiring immigrants. Your take? AU: Well, I’d rather hire someone with poor language skills and no Canadian experience than someone who is using a job at Nytric as a pit stop to achieve a different set of goals. We do look at a minimum level of communication skills. We do understand certain cultural idioms like what people mean in some cultures when they say “yes”[ smiles]. But apart from that, people coming to work for us should make an effort to understand the basics. They shouldn’t create more work for us in order to understand them. They don’t have to be fluent or proficient. I know people who have been in Canada for 15 years and they are not fluent! CI: What is the hiring process at Nytric like? AU: We have an initial conversation where we gauge the candidate’s basic skills – that they are able to read, write and can figure out a way to communicate. We have phone interviews, then meet and greets, and then group interviews where skills like problem-solving are tested. The educational background aspect is discussed to see if they are a right fit with us. Then there are detailed interviews with team managers and product managers who create situations and put the candidate on the spot to see how they think. CI: What is an absolute no-no when applying for a job? AU: People who don’t have a clue never make it. I have encountered people who don’t even go through the website of the company that they are applying to. They don’t remember who they have sent their cover letter to and they admit it! There is so much competition now, that you cannot afford to make such mistakes. CI: What is a sure way to score points with you in an interview? AU: I love it when someone engages me in an interview. When a candidate tells me “I was on your website and I saw how you solved that problem. How did you do that?” It shows me that a candidate is aware and is interested in working with me. Second, bring tangible samples of your work to us. If there’s something you designed or a project you worked on, simulations you did – bring your portfolio. Giving a visual representation of your work, researching the company and the person you are meeting are absolutely key. CI: What are the top tips for someone applying to Nytric for a job? AU: The top tip is to be persistent. We advertise with the usual suspects – job sites, agencies, etc. But people also just email me when they find my details online. I encourage unsolicited requests all the time. I look at every response because you never know who would be a good match with us. Sometimes even when there is no position available, I keep certain candidates in mind and I get back to them. I realize that, in this day and age, we have to approach talent creatively. In return, we expect job hunters to motivate us – by following up, by reaching out and by taking initiative. We have had scores of people asking to work for us for free for a period of three months because they want to attack a problem, look for a solution. We don’t want the headache of managing one more person on the team, but sometime the argument from a person is so motivating that we give in!